So, you'd like to give 1:48 scale a try? Congratulations - you're in for a lot of fun. Here are some suggestions to get started. This really depends on what you want to do, but I'd say a minimum is some veneer or preferably 1/32" (approx. 1 mm) sheetwood, and some thin wood strips (say 1/16" square, or about 1.5 mm). Basswood is easiest to work with. Stores that cater to model railroaders, model ship builders, and RC (Remote Controlled) airplane builders may carry it (or can point you to someone who does). Toothpicks are good too (both for making table legs etc, and for spreading glue). Also, you need white glue, a hobby knife and probably some paint and brushes. For knobs on furniture you'll need tiny seeds (e.g. brown mustard seeds) or no-hole beads. If you'd like more hints on tools, go to the Tools I use page! If you want to mailorder supplies, try my Supply sources page for some addresses. Non-working cupboard doors and drawers is more or less a standard in 1:48 scale furniture. Of course you can make them working if you really want to, but I suggest you don't strive for that kind of realism in your very first projects. If you really enjoy working in this scale, you might decide to try it later on. Anyway, non-working doors and drawers means that lots of furniture can be made from single blocks of wood, with fake doors and/or drawers glued on. Try it, you'll like it! If you feel uncertain about scaling down from full size, you can look in e.g. a free catalog from Hobby Builders' Supply , and divide the given measurements by four to find the right size for your 1:48 scale furniture. Stuffed furniture is usually an illusion in 1:48 scale. Sofa parts are fashioned from basswood or balsa, appropriate edges are rounded so the wooden parts give an illusion of soft padding when they are covered with fabric. Wallpaper the house before building it! The interior surfaces of 1:48 scale houses are usually finished before the houses are assembled, as it's tricky to work inside a house this size. I.e., walls are papered or painted, floor coverings are glued on, and ceilings are painted. If possible, mount the window curtains and paintings too. Working on a flat piece on a table is much easier than reaching inside a small room and trying to get things straight. When assembling a house, I usually fit, cut, and glue, the moldings as I go. What projects to start with - and not! Look for furniture of really simple construction (preferably made from only a few, large, rectangular pieces). For your first project, a bedroom suite is probably a better choice than a dining table with six chairs! Tall legs on chairs and tables usually take some time and patience to get straight and even, so furniture with short or no legs is easier to begin with. A dressed bed, a chest of drawers and a wardrobe can all be built from blocks of wood in various disguises, and will give you a chance of trying 1:48 scale without making you tear your hair off! Then you can go on to more and more complex designs, as you grow more and more confident. One of my very first projects was a roombox. I still haven't furnished it - because when I built it, I had no idea what furniture to put in it. I suggest you focus on building some furniture first, and don't build a house or roombox until you know how you want to furnish it. Also, if you find that 1:48 scale doesn't agree with you, you might use any 1:48 scale furniture you've built as toys in a 1:12 scale dollhouse. A 1:48 scale house (perhaps unfinished) wouldn't be nearly as easy to find a use for. If you're a subscriber of Dollhouse Miniatures (former Nutshell News), or NAME's Miniature Gazette, you can find several projects in their back issues to begin with. I suggest you visit NAME's website . Under "Tips and projects" there's a link named "Search for a project". Select "Smaller scales" and type in the kind of project you're looking for, e.g. "house". I got a dozen matches for 1:48 scale houses of various styles (plus some 1:24 scale houses) in various magazines. A search for "bed" also gave a dozen 1:48 scale matches. If you're seriously interested in 1:48 scale, do check out "Little Enough News", a.k.a. LEN. It was a newsletter that was entirely devoted to 1:48 (and occasionally smaller) scale. Each issue had a theme (e.g., 50's, Victorian, Castle, Southwest etc). Some even included plans for a 1:48 scale house! Unfortunately, new issues are no longer published, but you can order back issues and the popular LEN discussion group is open to everyone who'd like to join. Some of my own contributions to LEN are shown on the Little Enough News page. Also check out the DIY projects section of this site, where I'm occasionally adding new projects. 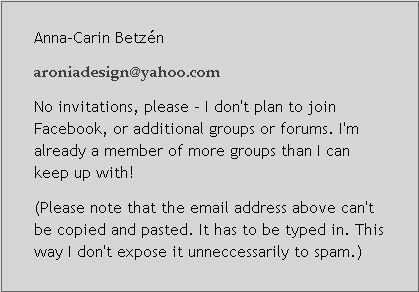 © Copyright Anna-Carin Betzén 2003, 2005.